Connecting rods will be 5.850″ center-to-center length, allowing for a reasonable compression distance for use with a dished piston. Be sure to use at least an ARP 2000 bolt material or better. If it’s an upgrade over 8740, pay the extra – this is not the place to cheap out. You’ll also want to be sure the rods you select are designed to improve stroker clearance at the pan area of the block, as well as the cam side. The pistons will be a custom configuration with a 31cc full round dish, 1.228″ compression distance, and 1/16-1/16-3/16 ring package. The dish size is based on 9.25:1 compression ratio with a 58cc combustion chamber volume. The compression distance is necessary in order to allow the underside of the dish to clear the top of the connecting rod pin end. It also requires a 9.015″ block deck height for “zero” deck, which provides the added benefit of better intake port and bolt hole alignment than the typical 9.000″ finished deck. My choice in a ring package will obviously match the piston groove arrangement, using a ductile iron, moly faced top ring, cast iron second ring, and standard tension oil ring. 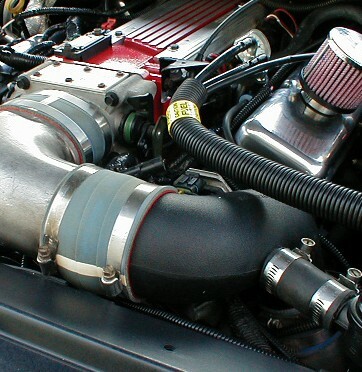 I’d recommend about .022″ top ring gap and .024″ 2nd ring gap for applications up to 12 psi boost. As a general rule of thumb, increase the gaps of both rings .001″ for every additional 2 lbs of boost. Race style bearings intended for large fillet crankshaft journals should be employed here. Clearances should be .0025″ for the rods and .003″ for the mains. It may be necessary to combine standard, under-size, and extra clearance bearing shells to acquire the proper oil clearance. Duration @ .050″ lift: Intake: 230 deg. / Exhaust: 244 deg. Intake centerline installed at 110 deg. The timing set will depend on whether or not you’re a fan of electric water pumps. If you don’t mind using one, then the Cloyes true roller double chain set will work great. Just know that you can’t use the factory cam driven water pump with this type of timing set. It also requires the use of a ’95 or newer opti-spark distributor. If you prefer the factory mechanically driven water pump, then I recommend the LT4 extreme duty set. I would also recommend that you get an oversize crank gear, as the chain is sloppy with the normal gear, and will be worse after align honing the block. These gears are available directly from Cloyes in .005″ and .010″ oversize. It’s been my experience that most of the time, the .005″ over gear is just right. This set also requires the newer style cam pin driven opti-spark. Rocker arms will be 1.6 ratio Comp “Pro Magnums”, and are an excellent value given the well-engineered placement of critical mass. Be sure to use the configuration meant to be used with 7/16 studs and guide plates. Note that if you plan to use the stock valve covers with these, you’ll need to bend and snip some of the supports of the hold down bolt tubes inside the covers. Pushrods should be .080″ wall, 5/16 diameter, chromemoly material, about 7.200″ length. You’ll need to verify the proper length by using an adjustable checking pushrod. The brand of cylinder head you use is up to your personal preference as long as the ports and components are of high quality. For this application, I have used AFR 195 fully CNC ported heads. I’m confident that another brand with equal port capabilities will yield similar results, but I know for sure the AFR’s make the numbers. These numbers were measured on my Superflow SF-600 w/computer controlled data acquisition using a cnc’d radius inlet plate, and a 2″ dia exhaust pipe 6″ in length. Unless you happen to already own, or are able to find a factory LT4 intake, you’ll need to invest in an Edelbrock LT4 intake manifold. It will need to be port matched to your cylinder head intake runners, and the throttle body face opened up to match a 58mm throttle body. The oiling system is comprised of a Melling M155HV high volume oil pump and a Canton oil pan and proper companion pick-up. The Moroso LT1 pan can be substituted, but I wouldn’t recommend the Milodon pan, as it has fitment issues that are not worth the aggravation in my opinion. Whatever pan you use, you’ll need to check the rod bolt clearance along the pan rail, and the internal scraper. You’ll also need to check for clearance between the number 8 crankshaft counterweight and the oil pan rail where it turns in behind the oil filter. That’s it for this installment. You now have a comprehensive list of the main components required to build this engine. In part 2, I’ll outline the block prep, key assembly specs and unique details. As always, I look forward to your feedback, questions, or comments on current or future topics. You can comment directly to this or any other article on the site or send me an e-mail. Please invite your friends to join us, and thanks for visiting …..
Wonting to build a 396 for my SS, I need the TQ. W/ AFR heads with the best value for power an longivity.